A researcher at Boston Medical Center (BMC) and the Boston University School of Public Health (BUSPH) warns that Zika virus could spread quickly to the U.S. There is currently no vaccine or cure. The mosquito-borne virus is believed to cause microcephaly in infants who are exposed in utero and causes rash and flu-like symptoms in adults and children who have been infected. An outbreak in French Polynesia in 2013 was responsible for 19,000 suspected cases, and since October 2015, nearly 4,000 cases of Zika virus-related microcephaly have been reported in Brazil. Microcephaly is abnormal smallness of the head, a congenital condition associated with incomplete brain development and a range of neurological complications. The findings are published online (open access) in advance of print in the Annals of Internal Medicine. Zika virus has been rapidly emerging in the Western Hemisphere in the last few months, and as of Jan. 22, 2016, there were 20 countries and territories in the Americas with Zika virus in circulation. Currently, it can be found in Central America, the Caribbean and Mexico, and transmission has occurred in travelers to these areas returning to non-endemic countries, including the U.S., Canada, Japan, Western Europe, and Israel. “At this time, we believe that Zika virus is primarily transmitted via infected mosquitoes, and therefore people living in or traveling to impacted areas are strongly encouraged to protect themselves against mosquitoes by using an effective insect repellent (containing DEET or picaridin),” said senior author Davidson Hamer, MD, director of the Travel Clinic at BMC, and professor of global health and medicine at the Boston University School of Public Health and School of Medicine. “However, there is some evidence to suggest that Zika virus could be transmitted via blood transfusion and sexual activity, so researchers are trying to determine if these are meaningful pathways to transmission.” There is also evidence of mother-to-child transmission, which appears to be responsible for the surge in cases of microcephaly being seen in Brazil. Hamer and his co-author, Lin Chen, MD, of the Mt. Auburn Hospital Travel Clinic, say there is substantial risk of introduction of the Zika virus in the U.S., given the presence of the mosquito species that carry the virus, Aedes aegypti and Ae. albopictus, in many states. In 2007, the first case was detected in a human, leading to an outbreak on an island in Micronesia. An estimated 73 percent of the island residents age 3 or older became infected; however, about 80 percent of these cases did not present significant symptoms. Zika virus, a mosquito-borne flavivirus that causes febrile illness associated with rash, has been rapidly emerging in the Western Hemisphere over the past few months. The virus was rarely identified until outbreaks occurred on Yap Island in the Federated States of Micronesia in 2007, French Polynesia in 2013, and Easter Island in 2014. It was initially detected in Brazil in 2015, in the northeast, and was subsequently identified in other states and several South American countries, including Colombia, Ecuador, Suriname, Venezuela, French Guyana, and Paraguay. Local transmission has been documented in Central America (Panama, El Salvador, Honduras, and Guatemala), the Caribbean (Martinique, Puerto Rico, Dominican Republic, and Haiti), and Mexico. Transmission has also occurred in travelers returning from the infected regions to nonendemic countries, including the United States, Canada, Japan, and Western Europe. 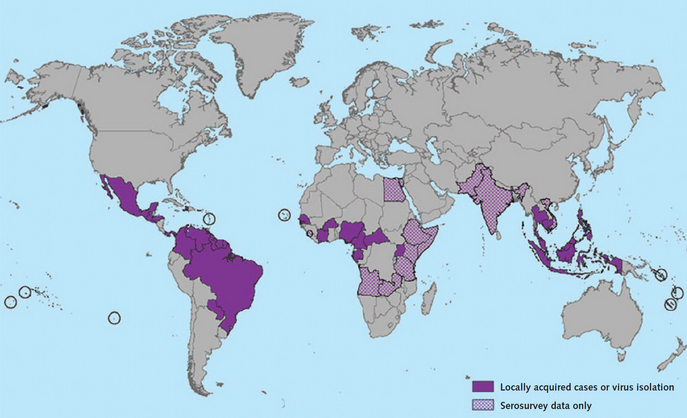 As of 22 January 2016, a total of 20 countries and territories in the Americas have Zika virus circulation. The explosive spread mirrors the emergence of chikungunya, which was first detected in the Americas (St. Martin) in 2013 and rapidly disseminated throughout the region.